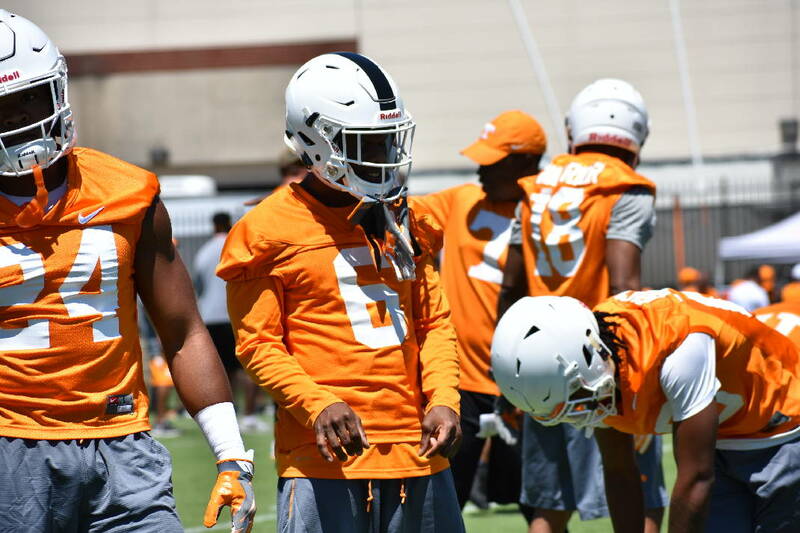 Graduate transfer cornerback Shaq Wiggins stretches before Tennessee's practice on July 30. Photo by David Cobb /Times Free Press. KNOXVILLE — It can be a perplexing decision whether to refer to Tennessee cornerback Shaq Wiggins as a veteran or a newcomer. The graduate transfer is two practices deep with his third major college football program. "He's an older, more mature guy when it comes to technique and drills," Tennessee secondary coach Charlton Warren said. "But he's a young guy in terms of understanding the culture and how we play here." Head coach Butch Jones and defensive coordinator Bob Shoop offered similar assessments of the 22-year-old Wiggins this past weekend as Tennessee completed its first two preseason practices. Wiggins brings big-game experience, four career interceptions and the skills of a proven veteran to a group of returning cornerbacks who did not intercept any passes last year. But his new coaches say he has adjustments to make as he competes for playing time ahead of the Volunteers' season opener against Georgia Tech in Atlanta on Sept. 4. Like a crop of freshmen who are four years younger, Wiggins is wearing a black stripe on his practice helmet. All newcomers wear the stripe until they are deemed to have acclimated sufficiently to the program. "I love Shaq, but Shaq's got a long way to go in terms of the intangibles, our practice habits, our style of play, working through some things," Jones said. "But I know this about Shaq: He's very prideful, he's very willing and he wants to do it." Wiggins began his career at Georgia in 2013 and started eight games as a true freshman before following defensive coordinator Todd Grantham to Louisville. He sat out the 2014 season, started every game for the Cardinals in 2015 and dealt with injuries as a junior before looking at graduate transfer opportunities for his final season of eligibility. After Wiggins chose Tennessee, Shoop said this summer that Tennessee's staff was hopeful he could make an immediate impact. Shoop likened his arrival to an NFL team signing a veteran free agent. Shoop made another NFL reference in regard to Wiggins on Sunday, saying that "I haven't thrown him in there and anointed him the next Darrelle Revis or anything like that," in reference to the former All-Pro cornerback. "We've kind of put him in a position where he's learning how we operate. He's learning how Charlton wants things, how we want things, how Coach Jones wants things within the frame of the program," Shoop said. "He's a talented player and he's just got to continue to do the things that are synonymous with Tennessee football and our culture."